Hey, hey! It's that time again...release time! 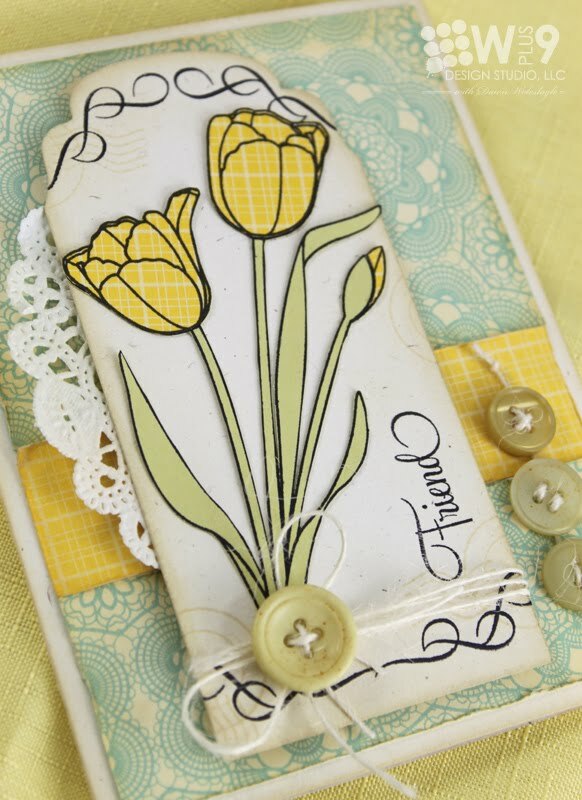 This month we have 2 new stamp sets and a new die to introduce. On top of an incredible release, we have the fabulous Lea Lawson making her debut with the Wplus9 Design Team. And, as if that were not enough, we have the incredibly inspiring Paulina Nakamura guest designing for us this month as well! I know, right?! Let's get started! 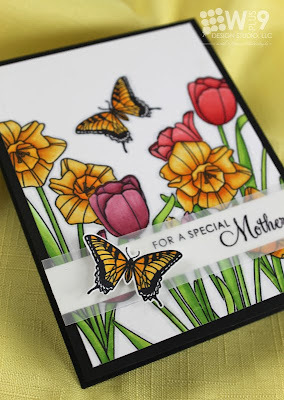 Over the next two days, we will be giving you a peek at a gorgeous Mother's Day inspired set. This set is awesome. You will be able to create a Mother's Day card for every single woman on your list. Seriously, whether it's your grandmother, aunt, sister, a friend, a co-worker, even a mom-to-be! This set has it all, including possibilities way beyond Mother's Day. My first card today is my favorite ever. Ever. I used both of the flower images included in the set, a little masking, and A LOT of copic coloring. But oh it is so worth it. Choosing the flowers to use for this set was cake. I used the favorite flowers of my two favorite and most influential women in my life. Tulips for my mother, and daffodils for my grandmother. I started by creating a mask for both flower images. 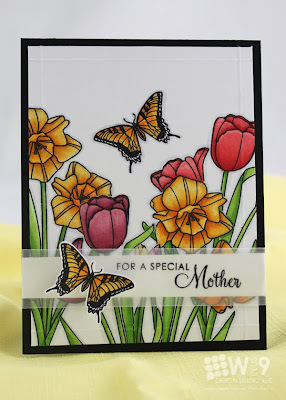 I stamped the two foreground flowers, layed down the mask, and stamped again to add in the background flowers. I then went to town adding color, color, and more color. 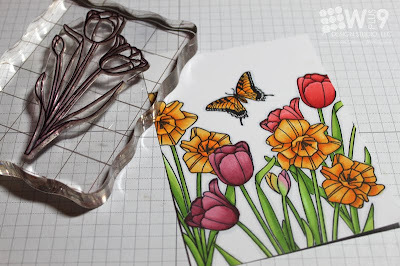 I just had to add a butterfly from Flora & Fauna I. I knew I wanted to keep the layout very simple, so for some added interest I scored a 1/4" margin all around the edges using my Martha Stewart scoreboard. For the sentiment strip I stamped "FOR A SPECIAL" and "Mother" in black onto a strip of vellum. 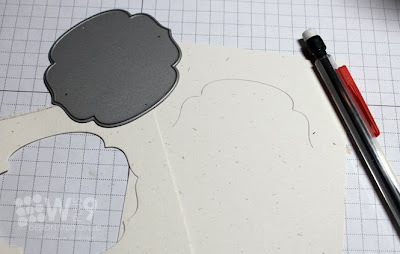 I then layered that over a smaller strip of white cardstock. 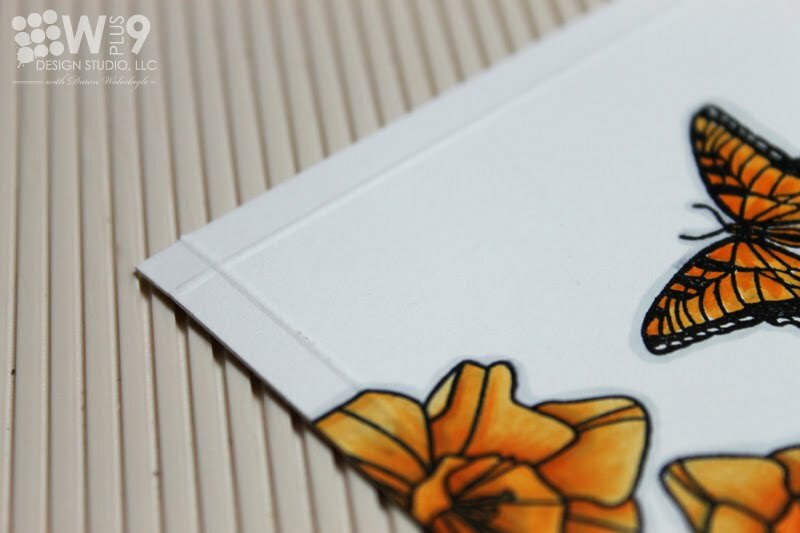 The coloring was so vibrant that the addition of the white underneath adds great balance to the bottom of the card and helps the sentiment to stand out. 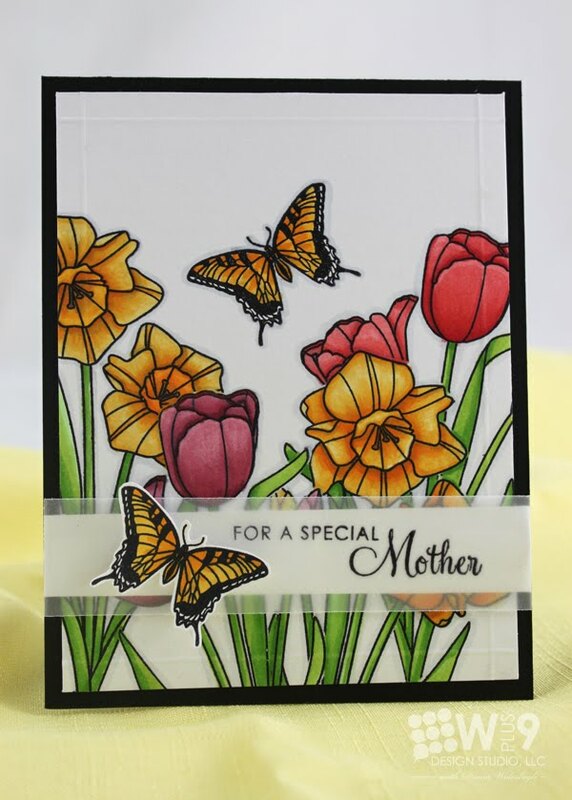 I matted the whole panel on a black card base, and of course stamped one more butterfly, trimmed it out, and added it to the left of the sentiment. For this one, I did a little paper piecing. I stamped the tulip once on green cardstock and then again on some patterned paper. 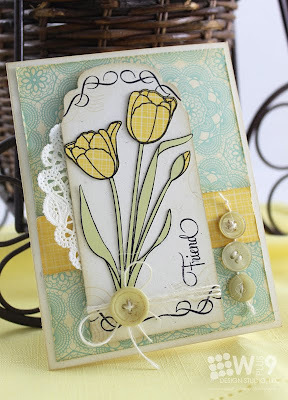 I trimmed out the entire image from the green and then only the blooms from the patterned paper. I adhered the blooms directly onto the green base. Notice the panel? This was so easy to create. 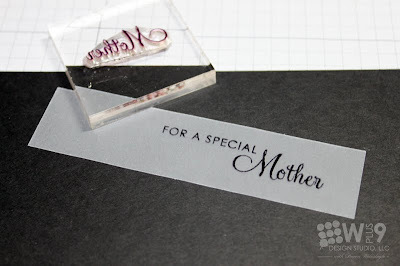 I used the top of our All Occasion Label die as a guide. I die cut it, and using a pencil traced the top half. I trimmed around the pencil marks and then used my paper trimmer to cut straight down the sides to my desired length. The little embellishments in black are a little peek at something from the set you'll see more about later this week. I added some random postmarks from Postmarked, and finished it with the "Friend" sentiment also included in A Special Lady. So there you have Day 1. I hope you are enjoying it so far. So I know my favorite ladies' favorite flowers', how about you? Who is your favorite lady, and what is her favorite flower? Leave me a comment by 11:59 PM EST March 29th. I'll pick a random winner from the comments to win A Special Lady. I LIKE you with a lil' bit-o-shabby! Yeowza! Well, that's not to say that I don't like super-sharp design savvy goddess, but I'll just say that the DIVERSITY suits you! THESE ARE EXCELLENT, my dear! You have me positively SALIVATING to get back "at it!" More stamping - YES, please! I ADORE your bonus feature of the All Occasion Label die - talk about PROVING itself: it REALLY is all purpose! Yipeeeee! Oh my...these are gorgeous, Dawn!! I am in awe of your Copic capability...that card is amazing!! Ohhh yet another beautiful set!! I love flowers and I am always glad to see my favorite flowers in the stamp sets. My favorite lady is without a doubt my mother. She is so patient, giving and self less. I love her so much and her favorite flowers are roses. Your projects are stunning! The coloring on the first card is so amazing. I can't wait to get this stamp set! My mom is by far my favorite lady and she loves so many flowers, not sure I could even list them - but, daffodils and lilacs are near the top of the list! You have absolutely won me with the tulips!! 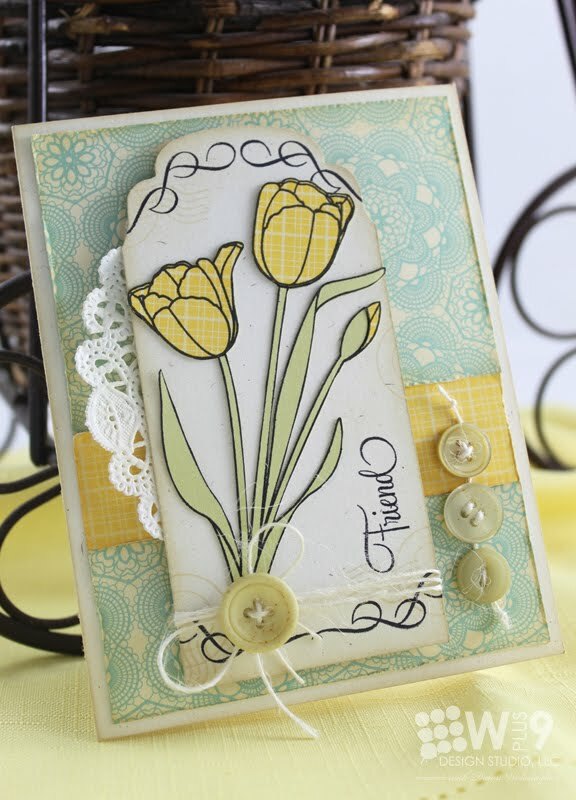 LOVE your two cards -soo beautiful and so perfect for spring cards! Thanks for the chance and for great inspiration! What gorgeous flowers! And your coloring is amazing! This looks like a must-have! Beautiful, beautiful cards Dawn! And a beautiful set too, as always. I know that my mother happens to love peach roses so I try to send them to her whenever the chance calls for it. 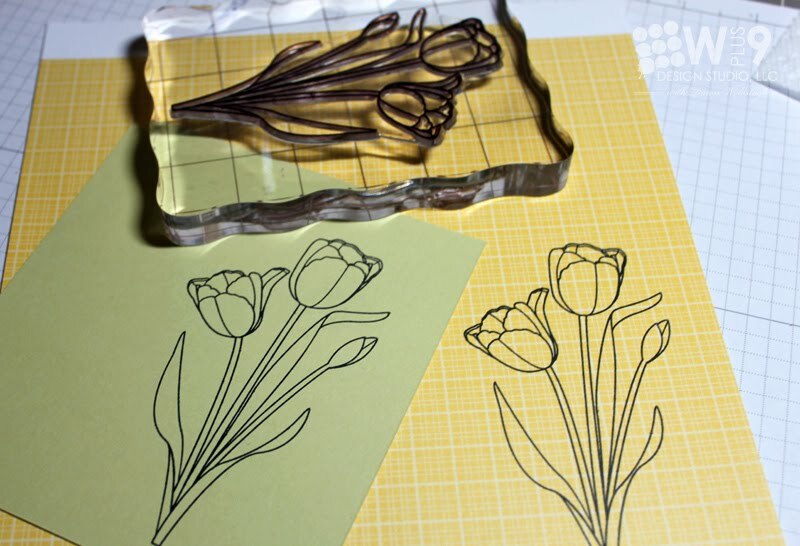 Tulip is my favorite flower and it will be lovely to have tulip stamps in my little stash...this time of the year I enjoy having a vase full of tulips as often as I can...is the only time you can find them around here. Both of your cards are gorgeous, It made me happy to see you doing paper piecing with this set, since it it will be how I use this set until I get my hands on some copics. These are GORGEOUS, Dawn! LOVE the way you've masked and colored your flowers in the first one and the soft, spring-like colors, with all those fab, textural elements, in the second! Just beautiful... as always ;)! Sorry, favorite lady... I think my mother is pretty cool and she loves daffadills. What beautiful cards! Fabulous coloring with the Copics!!! I love the coloring on the first card..the second is priceless in its own way!! I'm a soft hearted butterfly fantatic..I had to fall in love with the first card! My mom and her best friend(whom I call mom too) are the my most fav people. They love me unconditionally and never judge me..Lilies for my mom for sure! Her best friend loves roses! Can't wait to see the whole set! YES, all of your time spent is TOTALLY worth it! Gorgeous card! My mom is my special lady, but sadly I have no idea what her favorite flower is! Oh my gorgeousness!! Dawn!! This is just stunning...absolutely am in awe and adore it! Wowsers these are both stunning cards Dawn - the Copic colouring in the first is so rich, and I'm totally loving your shabby paper pieced tulips too. Great layering! Oh, I love it. My favorite flower, the tulip. Great pics and great cards. My goodness, these are both completely gorgeous, Dawn. I can see why the first one is your favorite ever, it is particularly stunning and vibrant. What a lovely set for the women in our lives, and for spring! BTW, my favorite lady is my Mom, and she doesn't have a favorite flower because she loves them all! These cards are SO VERY gorgeous!! LOVE your Copic coloring! My Mom is my favorite special lady! Roses, carnations, and Tulips are her favorite flowers! This is just stunning and I can't wait to see more! Dawn, your cards are both an inspiration, and sheer joy to behold. My mother is my favorite lady, but she passed in January. Her favorite flowers were roses. Red, and lots of them. My daughter is my next favorite lady, and she and I both love, love, love tulips! (I finally planted some last fall, and the leaves are poking through this Colorado earth very slowly). Anyway, I can't wait for this set so I can start my daughter's birthday card right away. Thank you for your beautiful cards. Stunning creations!!! Your Copic coloring is FANTASTIC!!! My mom is definitely one of my favorite ladies, and she LOVES just about every kind of flower!!!! She's always got baskets, vases, and flower beds full of many different kinds of flowers! Can't wait to see more sneak peeks! your set and your cards are truly amazing!! my mom is my fave lady! though i'm not sure her fave flower, but i do know she loves flowers in general. always has some in her house next to her virgen de guadalupe! Wow, what a beautiful set (from what I've seen) and you're right that first card is amazing!! I have a big family filled with girls and a few very special girlfriends so I will just tell you one of my favorite ladies is my best friend Kara and her favorite flowers are tulips (and it's her birthday today)! Thanks for the chance to win! I love the style of your design and no exception for this one!!! One thing I am sure, my mum is my most dearest ladies. I believe she loves Orchids, Roses and many more pretty flowers :) Looking forward to see other sneak peeks! Hmmm . . . I think my mom likes fresh flowers in general. Looking forward to seeing the other new release! Dawn, I am new to your site and I Love what I see! Your cards are soo gorgeous! The first card is amazing..your colouring is out of this world! I can't wait to see the rest of the new release! So glad I found you! Thank you for the how-to info. Your cards are beautiful. My favorite lady is, of course, my Mom and her favorite flowers are anthuriums (hope I spelled that correctly). Wow Dawn!!! Your copic coloring is fabulous! But I do love your shabby card too!!! You do such great work!!! I love to visit! Just realized I rushed to comment yesterday without answering the question; My favorite lady is of course my Mum (what would I do without her???? ), but I'm not sure what her fav. flower is - I'd think it's either orchids (loves to show off when they are flowering - again) or tulips because she always makes such beautiful arrangements with them when we come to visit. I love the cards... They're amazing. My favorite lady is definitely my mum and she loves carnations. Looking forward to more sneak peeks! BEAUTIFUL cards..I seriously love them both. Your coloring is refreshing and the shabby is to die for! I adore tulips and my mom! I LOVE seeing the daffodils and tulips!! I can't WAIT to see some in real life up here in upstate NY! I am looking to try my hand at Copic markers, can you share what colors you used in the beautifully colored card? Thank you!! Beautiful colouring on the first card! I love the design and the doily + buttons + papers on the 2nd card! The coloring on the 1st card is amazing! And love the softness of the 2nd card. My favorite lady is definitely my mom and her favorite flower is roses. This looks like a beautiful set. Both flowers together? Love it!